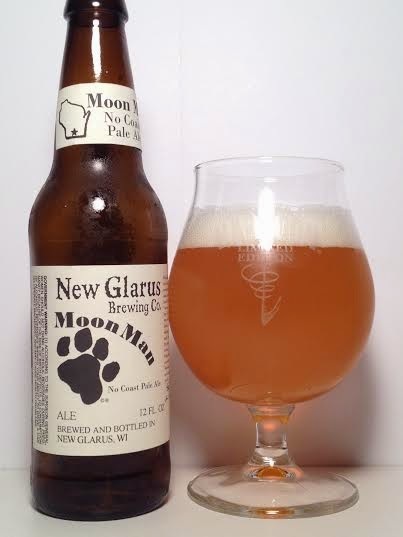 New Glarus has become a big name out of the midwest in recent years. My first taste came last year at a tasting, but the beer today was not one of them. Moon Man is a session ale brewed with five different hops. Pours a slightly hazy, but mostly transparent light orange. Pretty good carbonation and it produced one finger of white, fizzy head. There's a huge grapefruit aroma that fills the room. Interestingly I'm getting a tart, lemon sourness too. Hops and bitterness are very subdued. It's certainly more bitter on the taste. There's a little bit of lemon, but the grapefruit isn't as powerful as it was on the aroma. To be honest, there isn't too much to say as it comes off as rather bland. The mouthfeel is relatively thin with very little carbonation. I know it's a session ale, but that doesn't mean it can't be flavorful and smooth. Moon Man isn't a bad session ale, it's just underwhelming. There was a strong, fruity aroma that didn't carry through on the taste and it was just too thin and flat on the mouthfeel. Again, it's not repulsive, but you can find better examples of the style elsewhere.